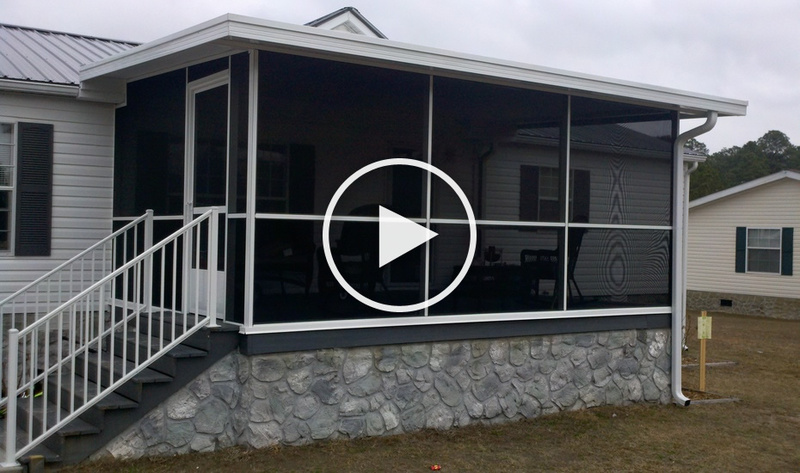 All Custom Aluminum constructs a line of screen rooms which stand apart from old fashioned wood built screen rooms in a number of important ways. First, we can construct our screen rooms on top of most existing slabs and decks, while wood framed structures require expensive footings. Secondly, our structures are engineered to be as strong as your home, yet install in the fraction of the time as wood framed rooms. And since the majority of our designs do not involve compromising the envelope or roofline of the house, our screen rooms involve far less cost than old fashioned wood frame construction which involves modifying your roofline. Finally, since we work with aluminum, our screen rooms are far in a way more open than those built with bulky wood components. 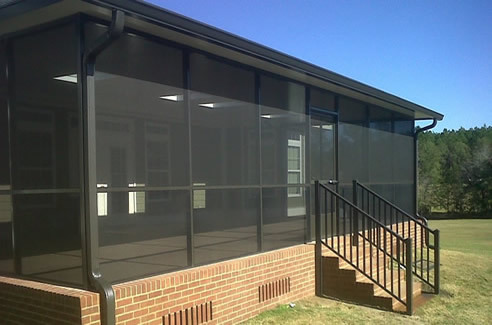 Screen rooms can be constructed with solid or screen roofs. Screen roof designs can vary in shape depending upon the circumstances. Solid roofs come in three basic options, insulated composite, non-insulated aluminum panels, and translucent polycarbonate. Many people consider screen roof enclosures to be germane only to swimming pools. But the fact is that patios, decks, and slabs are also perfect areas to enclose with an all-screen type design in order to establish outdoor living space. These designs attach to the eave of the home utilizing a very large and strong extruded structural gutter system which carries the weight of the structure as well as serving to carry runoff from the house roof. These structures create space which will remain bug-free and are perfect for play areas, entertaining, and growing plants and flowers. And in an age where mosquito borne illnesses like Zika virus, West Nile, and equine encephalitis are emerging as public health threats, enclosing a sanctuary that can remain free of these dangers affords piece of mind as well. Insect problems aside, having a screened roof enclosure over your deck or patio also keeps the area clean of leaves and debris. By far the most popular style of screen room is the insulated aluminum composite roof system. 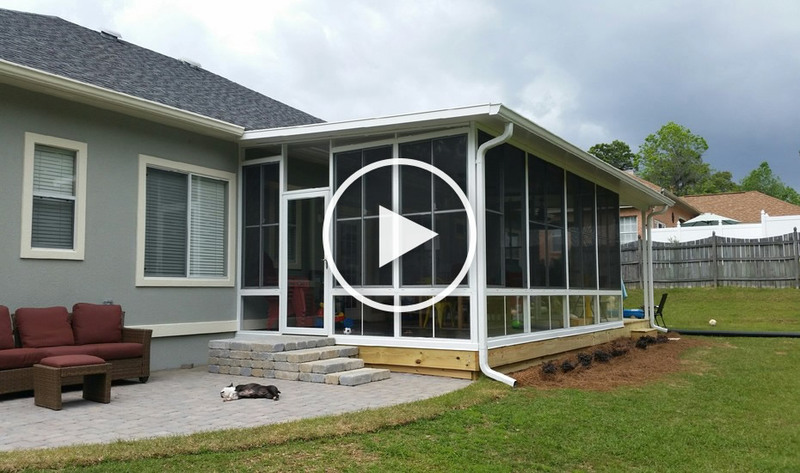 This style of screen room utilizes a high strength, walkable composite which has exceptional insulative and reflective properties that have earned it the Energy Star designation. These screen rooms afford protection from sun and rain while retaining a light and open feel. The core is a dense, compressed polystyrene insulation which has a density of one pound per square foot or more clad in an embossed skin of aluminum. By adjusting the density of the core, thickness of the skin, or overall thickness of the panels themselves, almost any span can be achieved up to thirty feet! But the vast majority of structures will utilize a three inch standard thickness panel, which keeps costs to a minimum. Because this system essentially contains all the elements of a ceiling, attic, and roof in one composite, it is very versatile and functional. Because it can be installed in a number of different circumstances that are problematic for wood framed type additions, this insulated composite roof system can be brought to bear where other options are not feasible due to the existing roofline, or other challenging circumstances. For instance, if you have a bay window, multiple fascia heights, a chimney to be notched around, or other unique situation, All Custom Aluminum can design a solution utilizing this roof system which will look great and cost less than other options. For the most part, these screen rooms are designed to attach to the home and slope away at ½ inch per foot, which sheds water while retaining most of the interior volume. However, this system can also be sloped more steeply or even configured to be a peaked shape. Moreover, this composite insulated roof system can be clad in shingles or virtually any other roofing material for seamless integration with your existing house roof. The system also comes with the option of skylights and interior electrical chases and fan beams. Thus even very large areas can be covered without the loss of light, and integrated electrical and ceiling fan designs can be accommodated without effecting the clean aesthetic look of the ceiling. For areas in which insulation is not a concern, All Custom Aluminum offers a line of non-insulated roof systems which keep out rain and sun while keeping costs to a minimum. Comprised of a series of interlocking panels, these roof systems are exceptionally waterproof while installing quickly with a level of versatility which is hard to beat. Unlike corrugated or sheet type roofing materials, these roof panel systems are self-supporting. Thus, no support structure is required. Non insulated roof systems can be used for awnings, screen rooms, sheds, or carports. And because they come with an exceptional finish available in a number of colors, they stand up to years of weather and provide an aesthetically appealing alternative to other options. 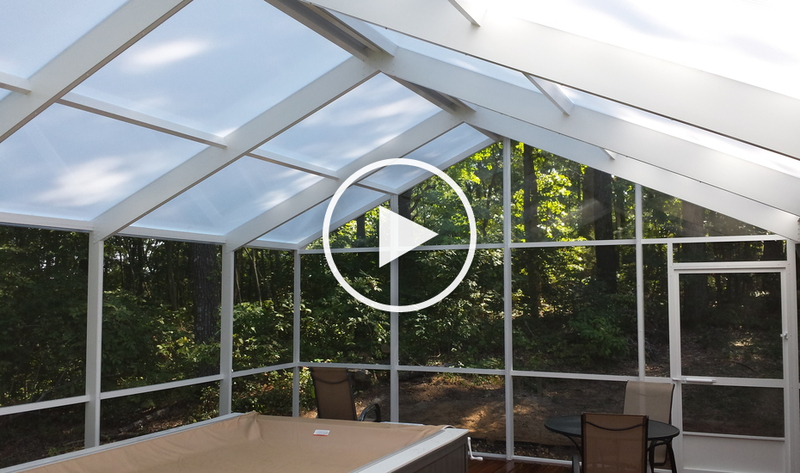 If you desire to allow the maximum amount of light into your space, but want to keep out rain and control the temperature to a greater extent, then our polycarbonate roof system may be the perfect choice. Comprised of a high strength upper and lower skin with a system of vertical fins which create an insulated tubular core, these panels are used in shopping malls, high end greenhouses, and year round enclosed pools. But they are also perfect for that special sunroom, conservatory, or screened room where light is key. Unlike the insulated composite panels and non-insulated aluminum roof systems mentioned above, polycarbonate roof systems rely upon a framework of aluminum supports for strength. They are applied to this framework much like glass, with a special glazing system of components which provide a dependable long-lasting installation.